The 2017 Mazda CX-5 has just arrived in Lachine, and once again it is poised to go above and beyond the expectations of its owners, as is the case since the compact SUV arrived on the market a few years ago. Repeatedly praised for its combination of efficiency, driving pleasure and versatility, the 2017 Mazda CX-5 continues to be one of the most popular compact SUVs in its segment, while being one of the most affordable. The 2017 Mazda CX-5 comes in three versions at Spinelli Mazda. The base GX model is available for just under $23,000 before taxes and preparation, and offers standard air conditioning, keyless entry, and power windows and doors. You will find in the two other versions of the 2017 CX-5 a sunroof, rearview camera, heated seats, navigation system, leather seats, 19-inch wheels, 9-speaker Bose audio system and a memory function for the driver's seat. It is also possible to opt for the i-ACTIVESENSE system which includes several driver assistance technologies. The 2017 CX-5 is offered with an optional all-wheel drive system and a six-speed automatic gearbox while front-wheel drive models are available with a six-speed manual transmission at no extra charge. The 2017 CX-5 comes standard with a four-cylinder, 2.0-liter SKYACTIV engine that delivers 155 horsepower and 150 lb-ft of torque. 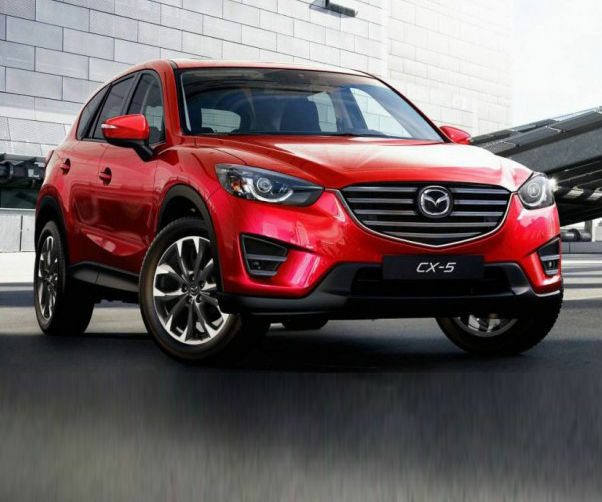 Thus equipped, the CX-5 offers one of the most impressive fuel consumption ratings in its segment with an average of 9.0 liters per 100 kilometers in the city and 6.8 liters per 100 kilometers on the highway with the manual transmission. In other versions of the 2017 Mazda CX-5, you will find a more powerful 2.5-liter SKYACTIV engine developing 184 horsepower and 185 lb-ft of torque. Thanks to SKYACTIV technology, this engine has an average fuel consumption rating of 8.9 liters per 100 kilometers in the city and 7.1 liters per 100 kilometers on the highway with front-wheel drive and the automatic transmission. Although it is much more powerful than the 2.0-liter engine, it still remains fuel-efficient even with AWD. Its average fuel economy rating is indeed 9.3 liters per 100 kilometers in the city and 7.6 liters 100 km on the highway. To learn more about the new 2017 Mazda CX-5, contact us today at Spinelli Mazda in Lachine.